Preventive care, including regular (6 month) exams and cleanings. Space maintainers and, for older kids, orthodontics. One of our newest and most exciting orthodontic options we offer is DNA appliance therapy. Based on the concepts of Pneumopedics® and Craniofacial Epigenetics, the DNA appliance allows the body to reposition the mandible while gently redeveloping the midface and remodeling the upper airway, while correcting the positions of the teeth into a more natural position. Because kids’ orofacial structures are still developing into their teen years, DNA appliance therapy can easily provide dramatic results, bringing the jaw and facial structures into a more optimal position. It can even make wisdom teeth removal a thing of the past, by creating enough room for those teeth to erupt naturally and comfortably. It’s recommended that you bring in your child for their first visit after their first tooth erupts or by their first birthday. Part of this is to familiarize them with the office – a place that can seem weird or even scary to a young child – but it’s also to get an early look at their dental and orofacial development. 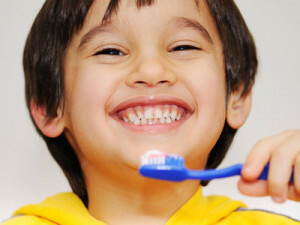 That way, we’re in a better position to catch any problems early, when they are more easily treatable, and help your child develop a naturally healthy and attractive smile. Contact our office today to make an appointment for your child.